Doctor Who was notorious for borrowing heavily from classic literature, but it was neither the first nor the only one to do this. In cinematic terms there has always been a subgenre of pseudo science fiction, where non science fiction concepts were given a fantastical veneer and peddled to the public as science fiction. 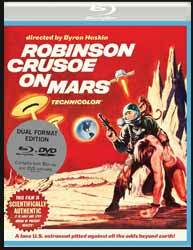 Robinson Crusoe on Mars (1964. 1 hr, 49 min, 48 sec) is such a beast. The film is based on the Daniel Defoe story of a shipwrecked sailor and directed by Byron Haskin, who had previously directed the slightly cheesy, but generally excellent War of the Worlds (1953), as well as Conquest of Space (1955) and From the Earth to the Moon (1958). This version sees Kit Draper (Paul Mantee) and Dan McReady (Adam West) and their monkey reaching Mars only to nearly run into a meteorite. In their efforts to avoid collision both men abandon their craft, crash landing on the surface. Only Kit and the monkey survive. The first half of the film details Kit’s attempts to find air and water. The film sidesteps science and provides Kit with rocks which give out oxygen when burned and the monkey finds a source of water and food, proving that the monkey had more chance of survival than Kit. Just when you think that the monkey would fill the role of Friday, or that you couldn’t get enough of Kit and the monkey going about their domestic chores, the film takes a decidedly silly turn. Initially, Kit starts to hallucinate from loneliness, but this is quickly overshadowed when he finds the remains of a murdered alien. Fearing discovery he destroys his own orbiting ship. Eventually aliens turn up and Kit encounters an escaping slave, who becomes his man Friday (Victor Lundin). The more interesting elements, like who are the aliens and what are they mining on Mars, are not addressed by the movie. Their film's ships were created by Al Nozaki which were almost identical to the Martian spacecraft he constructed for War of the Worlds. The aliens leave and we are left with the domestic life of Kit, Friday and the Monkey. When they return, Kit and Friday are forced to flee their home and head to the ice cap hoping for rescue. The print is generally good, with strong colours. The picture does contain grain, but that is probably related to the original film stock and is shown with an aspect ratio of 2.35:1, the film's original ratio. The movie works best when there are few or no special effects, the live action shots done in Death Valley still look impressive, but the effects date the film and remain an overall weak aspect. This is a film of its time, but having said that, on the one hand it is not as bad as many would remember but is a throwback to a more innocent form of science fiction when you consider that in the same year saw the release of both Failsafe and Dr Strangelove. For extras you get the original Theatrical Trailer (4 min, 01 sec) and a full length commentary from Robert Skotak a visual effects artist and two time Oscar winner, who has worked on many science fiction films. It’s quite a wide ranging commentary and worth listening to as Skotak is incredibly knowledgeable about all aspect of the film's creation. If you haven’t picked up a copy on its previous releases, it’s worth adding it to your collection.